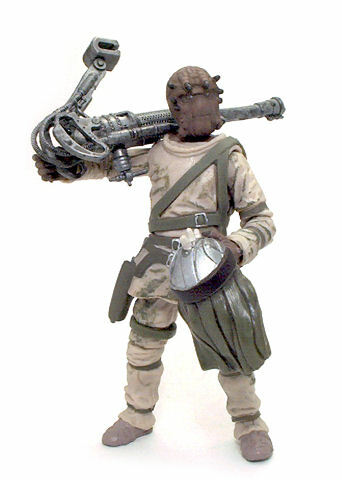 Hasbro releasedNikto Gunner in 2009 as part of the fourth wave of red-carded Legacy Collection figures, a wave inspired in the characters from the Episode VI: Return of the Jedi movie. 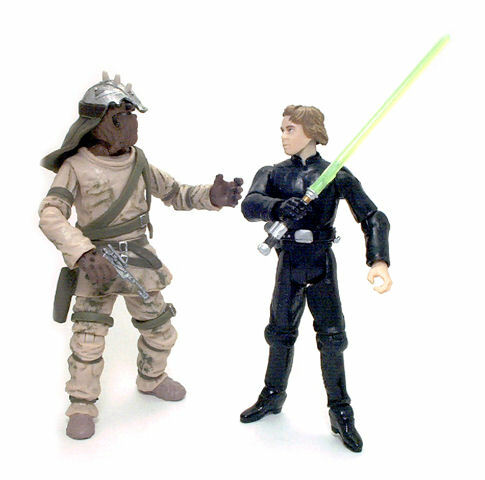 According to Wookieepedia, Niktos are a species that present a good range of physical variety, not unlike us humans, so it turns out both Giran and the Gunner are members of the same species, despite their obvious differences. 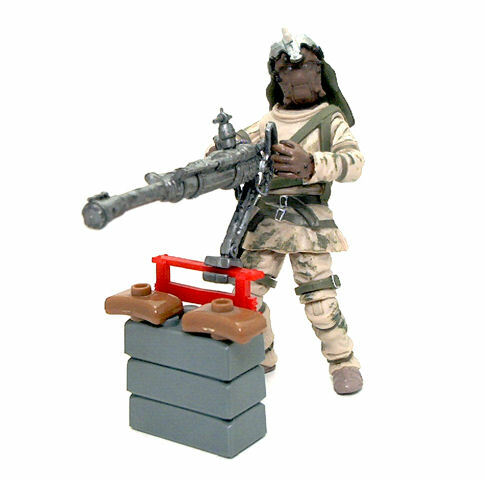 This Nikto Gunner’s name is Nysad, according to the same entry in the Wookieepedia, but probably this hadn’t been finalized by the time Hasbro had all the card inserts designed for this figure, so he’ll remain being addressed by his occupation. 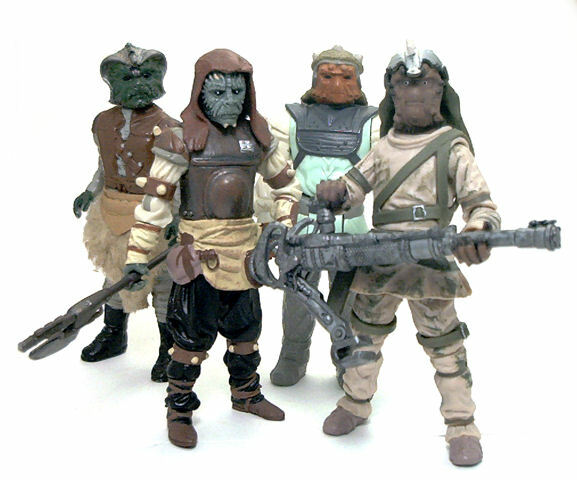 The Nikto Gunner was seen briefly during the battle on Jabba’s Sail Barge over the Pit of Carkoon, where Jedi knight Luke Skywalker makes short work of him and several of his cohorts. Although some Niktos have been made over the years, none had this specific outfit on them, so this counts as the first movie accurate one I have. 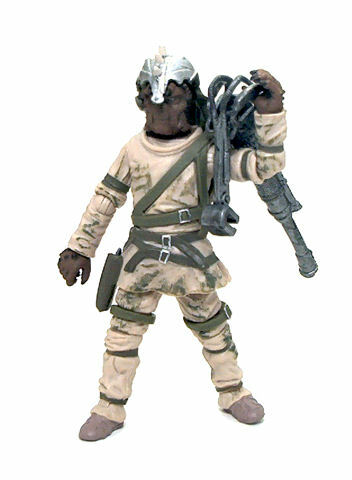 The Nikto Gunner is dressed in a combination of loosely fitting tunic and pants, with several leather straps running across torso and limbs. The clothes are made from a light tan plastic and have stain marks applied on them in a muddy brown color, causing the otherwise subtle sculpted fabric textures to stand out. Some of the leather straps are actually sculpted on him, but at the torso and upper thighs Hasbro decided to make them separate pieces, molded from a rubbery material. This will no doubt allow the re-use of this body sculpt to produce different characters by making subtle changes to the add-ons without even changing the head or hands. Both head and hands are nicely sculpted and capture the on-screen character fairly well, although he does seem rather puffy and his expression is possibly a bit too placid for a hired thug. These pieces are painted in a muted orange/brown hue, with all the bony ridges, nails and spikes painted in a much darker tone. The only problem I have with the paint on the face, is that the overall finish is rather muddy and since there is not enough contrast between the raised and recessed points of the face, it is difficult to identify the facial features from afar, even with the stark black and white paintjob on the eyes. • Ball jointed neck. Good, unimpeded motion range all around. • Peg & hinge shoulders. Excellent motion range on both sides. • Peg & hinge elbows. Very good 90° bend and 180° sideways rotation. • Swivel wrists. Free 360° rotation. • Swivel waist. Free 360° swivel. • Swivel hips. 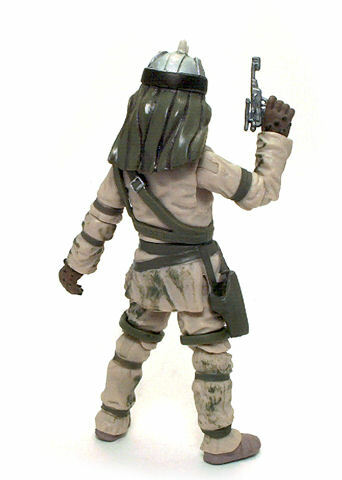 These are limited by the rubbery skirt piece that conforms the lower edge of his tunic, but range is still pretty good. • Peg & hinge ankles. Good forward bending and extending, 360° swiveling. The Nikto Gunner comes equipped with a spiked silver helmet with a leather flap at the back to cover the back, a thin pistol that fits into the functional holster sculpted onto the skirt piece and a small silver laser cannon. All of the accessories are made from silver rubbery plastic and except for the pistol, both the cannon and the skullcap have a slight paint wash to the metal surfaces to add a tarnished look. The helmet is possibly a tad too bright, but for the most part the cannon looks like a heavy piece of well-used machinery. 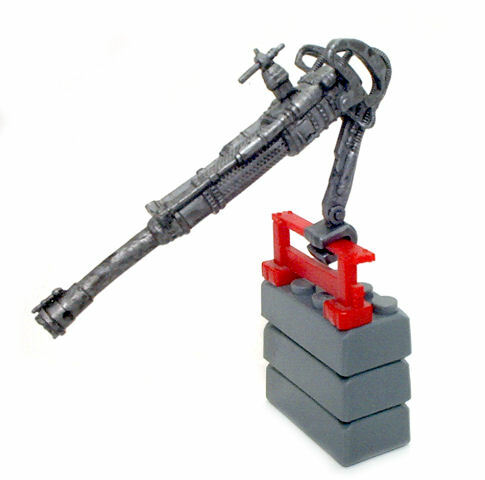 The cannon was designed with a clamp to affix the weapon to an external support, like say, the railing around the deck of a sand-skiff or sail barge, and it’s operated with two trigger handles that can be seen along with several conduits jutting from the firing control box. The spiked skullcap has the rear flap sculpted in such a way that the Nikto Gunner has to turn his head slightly to the left in order for the leather flap to rest flush with the back of the figure, but at least it doesn’t pop out every time the arms are raised or the head turned. 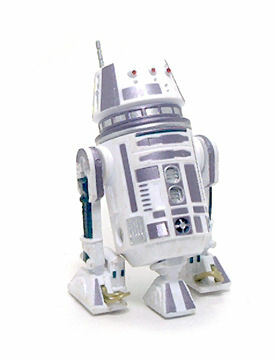 Like the rest of the figures released within the Legacy Collection, Nikto gunner ships with a Build-A-Droid Piece, in this case the right leg for the R5-C7 astromech. 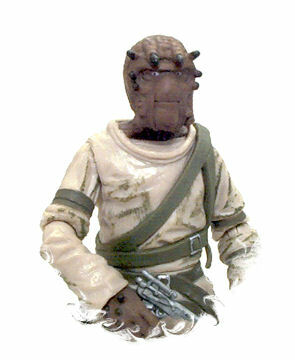 I ended up liking this Nikto Gunner figure even better than wave companion Giran (the Nikto Rancor Keeper), because even if he’s not as immediately striking in terms of looks, he still is an interesting looking character with very good detailing and well executed articulation.